Devout Catholic and Zimbabwe president Robert Mugabe traveled to Vatican City for the inauguration of Pope Francis I, bypassing a travel ban imposed by the European Union, which does not apply to the Vatican City state. Zimbabwe is in the midst of a referendum to change its Constitution. 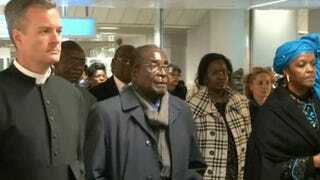 Does Mugabe's travel during this important time signal a greater devotion to the church than to his country? The Burton Wire has the answer.